The Chincoteague Pony breed as it is known today is a compilation of different breeds. 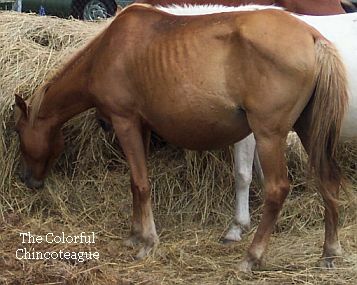 This page is an effort to collect the scattered information on known and possible breeds that have been introduced into the Chincoteague Pony. If you have any additional information, rumors, or theories you would like to share please contact me. Horse/pony names are linked to pedigrees in the The Chincoteague Pony Pedigree Database, All Breed Database or Misty's Heaven wherever possible. The main and popular theory of the breed's early origins is the ponies were from a shipwrecked Spanish Galleon. It is also occasionally stated that the first settlers discovered that Assateague was already inhabited by wild horses. 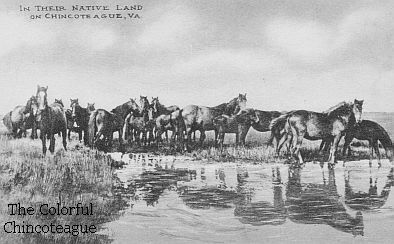 The second origin theory is that that Chincoteague and Assateague residents kept their horses (also sheep and cattle) loose on Assateague to avoid fenced livestock taxes. Whatever the origin, it is well documented that there have been feral horses on Assateague since the 1700's. There have been deliberate introductions of different breeds throughout its history, namely by the Chincoteague Volunteer Fire Department, owners pre-dating the Fire Department's ownership of the feral herds, and of private breeders. The outcrossing has been for a variety of reasons, to reduce inbreeding, introduce colors, improve breed conformation, etc. A study published in 1991 titled Genetic Variation and its Management Applications in Eastern U.S. Feral Horses took samples from 60% of the Virginia herd in April 1987. The study found a close genetic resemblance between the ponies and two breeds primarily, the Paso Fino and the Shetland. A genetic resemblance was also found to the feral island herds of Cumberland Island and Ocracoke Island. The study found a higher level of genetic diversity in the herd compared to the other feral Atlantic herds which was possibly "the result of repeated introductions of horses to the island from a variety of sources." Color can give us some ideas as to when outcrossing was done and to the breeds involved. Many sources state that the breed was originally all dark colors. Leonard D. Sale wrote in 1896 in The Horse Review of Chicago that, "The prevailing colors are bay, brown, chestnut and light sorrel. I have never yet seen a grey, piebald, dun, or yellow purely bred island pony." However an earlier article from 1891 in the New York City newspaper The Sun stated that the ponies "are most frequently black, gray, sorrel, or dun." A Washington Post article from 1902 stated that the prevailing colors were bay and black and in 1910 the Pittsburgh Times wrote that "Light bays and sorrels predominate. A fair number of brown bays will be found, while black. White and dun-colored ponies are exceedingly rare." In 1923 a St. Petersburg Times article described the ponies as "bay, gray, dun, black, and sorrel", however less than a decade later a Delmarva Star article describing the 1930 Pony Penning described the ponies as "many colored", with blacks, browns, bright bays, and so many with spotted coats. *The dun mentioned in this section is likely buckskin in modern terms. Buckskin was commonly traditionally called dun and it is still called so in parts of Europe. Due to the breed's complicated history and the scattered nature of Chincoteague registries through the years the boundaries can be muddled as to what ponies are considered partbreds or purebreds. The guidelines used here are if the Chincoteague Volunteer Fire Department, or the feral herd owners prior to their ownership, did the outcrossing then the resulting partbred ponies are considered purebred Chincoteagues. Additionally, if a partbred pony was generally regarded to be a purebred Chincoteague it is considered to be a purebred. 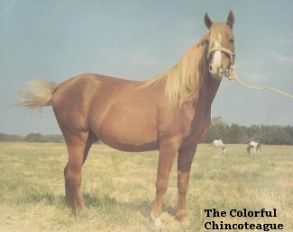 There are historical and modern examples of partbred ponies from private breeders that were regarded as purebred Chincoteagues and some that were regarded as partbred. The amount of outcrossing in the feral Chincoteague Pony herd will appear to be lessened in the future based upon the National Wildlife Refuge's 2014 Chincoteague Pony Management Plan. The plan states, "To preserve the integrity of the registered Chincoteague pony breed, the CVFC will no longer introduce foreign stock into the Refuge population. If deemed necessary by CVFC in consultation with a geneticist and the Refuge Manager one "healthy" foreign mare may be introduced to mate with a stallion and give birth. Shortly thereafter, the foreign mare will be transported off the Refuge. The same mare's progeny will remain behind to continue the linage of this new genetic input." 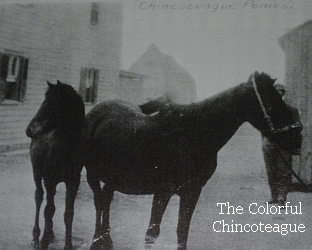 Early 1900s Chincoteague Ponies. Photo from The Waterman and Wild Ponies by Robert Mears. Photo from an undated postcard prior to pinto being introduced. An article from the Virgina newspaper Radford News Journal from 1977 stated that crossed new stock into the feral herd every 9 to 10 years and Arabians were one of the breeds used. The Wild Horse Dilemma by Bonnie Gruenberg quotes a former Chincoteague resident that due to the decimation of the feral herds after the Ash Wednesday storm of 1962 select mares with good conformation were bred to stallions of other breeds including Arabian. Al-Marah Sunny Jim was donated to the Chincoteague Volunteer Fire Department in 1965. He was bred to Stormy twice, the resulting foals being Rainy and Misty II. He was likely also released out on Assateague. Skowreym was leased to the Chincoteague Volunteer Fire Department for two years in the early 1960's. A bay tobiano stallion named Gordo was reportedly a half Arabian. In 1995 the Arabian stallion Premierre was brought to Chincoteague and bred to mares at the Leonard Farm. Premeirre was later released out on Assateague where he later died in 1999/2000. He was listed as Premier by the now defunct Chincoteague Pony Association. 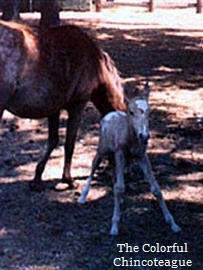 The pick of the 1996 foals were kept. The foals that weren't kept were sold in the auction and several of the ones kept were sold as "buybacks". A bay stallion was kept at the carnival grounds with a group of mares after Premierre died. He was listed as Striking Gold by the Chincoteague Pony Association and has also been called Striking Cadet. His registered Arabian name is currently unknown. The Maryland herd of Assateague Horses, managed by the U.S. Park Service, and the Virginia herd of Chincoteague Ponies, managed by the Chincoteague Volunteer Fire Department, have been separate since 1968 when the Park Service took over their management. A fence on the state line separates the two. The original Maryland herd consisted of 21 ponies, 9 stallions and 12 mares, and there has been no outcrossing into the Maryland herd since then nor have there been Virginia ponies introduced into Maryland. Assateague Horses frequently cross the state line fence, but they are usually gathered and returned to Maryland. There have been multiple Maryland ponies whose ownership have been transferred to the CVFD. Some were transferred due to being problem horses and others continually crossed the state line fence after being returned. Top Gun was transferred to the CVFD in 1991 due to being a problem horse. In 1994 12 Assateague Horses were transferred, eight being problem horses and four were young stallions that continually crossed the fence. Five of them of sold at the 1994 auction and the rest remained as part of the feral herd, including Fire Star. Cherokee Chief, ownership transferred in 1998, and Spirit of Assateague, ownership transferred in 2003, both continually crossed back into Virginia after being returned and became successful herd stallions in Virginia. Glacier and A Perfect Storm also ended up with herds in Virginia. The National Wildlife Refuge's 2014 Chincoteague Pony Management Plan states, "On occasion, CVFC also replenished the herd with "problem" ponies from ASIS. These feral horses had been involved with visitor/pony conflicts in the campground areas. Only their offspring were sold. It has been the policy of CVFC to no longer supplement their herd with NPS northern herd animals. These animals proved to be problematic for the Fire Company and the Refuge. However, these animals may have a more direct genetic link to the current Chincoteague ponies than past genetic introductions." Leonard D. Sale wrote in 1896 in The Horse Review of Chicago that an Assateague resident imported and released a "Canadian bred pony stallion" in an effort to improve the breed. The resulting ponies from the Canadian pony were described as being "course-haired, gummy-legged and large brute". The stallion also was apparently gaited as his descendants paced, "A few island ponies pace, but they carry an infusion of the Canadian scrub blood." The Wild Horse Dilemma by Bonnie Gruenberg quotes a former Chincoteague resident that due to the decimation of the feral herds after the Ash Wednesday storm of 1962 select mares with good conformation were bred to stallions of other breeds including Morgan. An article from the Virgina newspaper Radford News Journal from 1977 stated that crossed new stock into the feral herd every 9 to 10 years and Morgans were one of the breeds used. A Chincoteague Pony management plan from 2013 started that "A wide variety of breeds such as Morgan, Welsh, Shetland, Arabian, and Mustangs were placed in the Chincoteague pony herd to increase genetic diversity and vigor among the present stock". Several sources state that twenty Nevada Mustangs were purchased from the Bureau of Land Management in 1939 and set free on Assateague. In 1976 a group of 38 BLM Mustangs were added to the herd to fill a void left when half of the herd had tested positive with Equine Infectious Anemia in 1975 and had to be euthanized. An article from the Virgina newspaper Radford News Journal stated that the Mustangs were from an adoption center near the California/Nevada state line and they chose solid bays, blacks, and greys with the goal to bring the Chincoteague herd back to the original solid colors. The Assateague Ponies by Ronald Keiper most of these Mustangs didn't adapt to the new environment and died within the first year. Another group was apparently introduced in 1983/1984 according to an attendee of the 1984 Pony Penning. It also appears that much of this group also did not survive. The well known feral stallion Pirate, aka Broken Jaw, is often said to have been Mustang or part-Mustang, presumably from this or the previous group. Two Mustang mares branded as having been gathered in 1982 in Montana, pictured below, survived in the feral herd into the 2000's. The Assateague Ponies by Ronald Keiper states that two buckskin Spanish Mustang (aka Barb) stallions were donated by an Ohio restaurant owner in 1976. An article from the Texas newspaper Bryan Times stated that the restaurant owner was Bob Evans and donated the stallions after hearing about Equine Infectious Anemia affecting the feral herd. The two stallions where from his personal Spanish Mustang herd from bloodlines that originated in Utah and New Mexico. A Chincoteague Pony management plan from 2013 started that "A wide variety of breeds such as Morgan, Welsh, Shetland, Arabian, and Mustangs were paced in the Chincoteague pony herd to increase genetic diversity and vigor among the present stock". BLM branded Mustangs were part of the feral herd as late as the early 2000's. 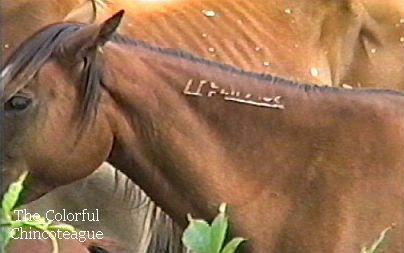 The Wild Horse Dilemma by Bonnie Gruenberg quotes a former Chincoteague resident that due to the decimation of the feral herds after the Ash Wednesday storm of 1962 select mares with good conformation were bred to stallions of other breeds including Paint. TripleAction Penny is the dam of Chemina Mist and Windjammer by the Misty great grandson Cyclone and is subsequently found in the pedigrees of a number of Misty descendants. The Wild Horse Dilemma by Bonnie Gruenberg quotes a former Chincoteague resident that due to the decimation of the feral herds after the Ash Wednesday storm of 1962 select mares with good conformation were bred to stallions of other breeds including Quarter Horse. A Philadelphia Times article from 1887 wrote that the locals believed that the horses aboard the wrecked ship were Shetlands. 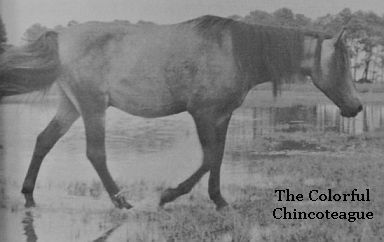 The writer described the ponies at the 1887 penning as, "In size the Chincoteague pony approximates that of the Shetland. The hair on their bodies is thick and shaggy and their manes and tails are long and glossy." Many sources state that pinto was introduced into Chincoteagues through Shetland outcrossing. Once Upon an Island by Kirk Mariner states that Clarence Beebe imported a Shetland for breeding from which the many pintos found today descend. Ronald Keiper wrote in his book The Assateague Ponies that pinto was introduced in the 1920's. An Associated Press article from July 1925 states, "The strain is not so pure now as it was in former years. The Shetland pony together with other breeds has been introduced and the effect has wrought variety." A Chincoteague Pony management plan from 2013 started that "A wide variety of breeds such as Morgan, Welsh, Shetland, Arabian, and Mustangs were paced in the Chincoteague pony herd to increase genetic diversity and vigor among the present stock". A source has stated that a photo appeared in the Baltimore Sun in the 1960s of a Thoroughbred stallion named "Red" leading a band of mares on Assateague. This would be within the same era of the well documented Arabian outcrossing that was done in that time period. Stormy's oldest daughter, Windy, was sired by a Thoroughbred and was the result of an accidental breeding. His name is unknown at this time. Windy is "officially" listed in the Pictorial Life Story of Misty as being by a different stallion named Lightning. Misty's Twilight was sired by the Thoroughbred Big Bluffer, however she is generally considered to be a partbred. Wallops Island is a neighboring island to Chincoteague and once also had feral ponies. When Wallops was purchased by the government in 1971 to create the Wallops Island National Wildlife Refuge the ponies were incorporated into the herds on Assateague. Welsh is stated in several sources as having been crossed into Chincoteagues. 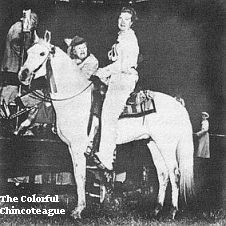 One source stated that a chestnut roan stallion from Farnley Farm was sent to Chincoteague for three years and was bred to mares. The brief presence of roan in Chincoteagues was likely the result of this outcrossing. A Chincoteague Pony management plan from 2013 started that "A wide variety of breeds such as Morgan, Welsh, Shetland, Arabian, and Mustangs were paced in the Chincoteague pony herd to increase genetic diversity and vigor among the present stock".